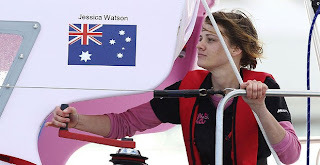 Sailing adventures of CRAZY LADY: Inspirational Jessica Watson. Kevin says she's a hero to all young Australians and young women. 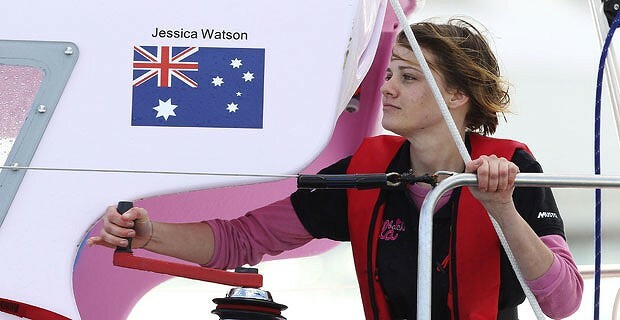 I say she should be a hero and inspiration to all Australians regardless of age. NSW premier Christine Keneally's speech probably one of the best I ever heard from a politician, and I quote. "those that don't take risks never win"
Jess says she just a normal girl with a dream, that worked hard for it. I would go further and say her message has universal appeal across national boundaries and ages. That is one of the reasons for her great appeal. Following her blog got me reconnected to my larger sailing dreams. I have been sailing the Chesapeake Bay since 1992, after moving to Maryland from New Mexico. A person needs to get out of their comfort zone to grow. I now want to do some coastal cruising, and sail to New England. Eventually, with a different boat, I would like to sail the Caribbean and beyond.